NitsLoch v1.0 is a remake of an old mac game called GangWars created by DoerrBros. The remake is a Java application written by Darren Watts and Jon Irons. The focus of this game is to walk around a couple of cities and clear out all the gangs from the streets. 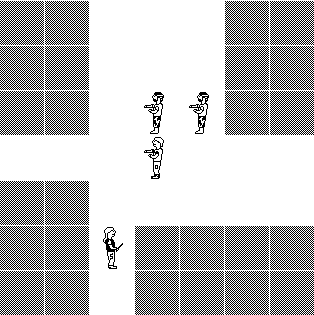 The player fights all sorts of enemies, from rats, to innocent bystanders, to ninjas. There are many interesting weapons to find along the way, and the style of the game is reminiscent of a prototype for the wildly popular Grand Theft Auto series of video games. The game takes place on a two-dimensional grid, the building blocks of which are either walls, streets, or (occasionally) exits. All manner of enemies roam the streets. Through careful exploration of the game world, you will establish patterns of movement, find out where all the shops and bars are, and slowly eradicate all gang leaders on the map. The original two-city scenario takes a few days to complete, but thanks to our editor, you will find many new scenarios, or make your own. After you've spent all this time beefing up your character, you may find a new scenario you want to put him in. Thanks to the easy (if expensive in-game) character export process, you can bring your character into any scenario, even trading characters online. Don't expect much visual appeal. This game is very old, and we decided to focus more on gameplay and extensibility than on graphics. We wanted to keep things simple so you could have fun playing. Besides, Java isn't exactly the best platform for graphics-intensive gaming. However, anyone can replace the existing black and white pictures with their own. If anyone feels like creating an improved set of images for the game, please send them to me so that I can make them publicly available! One of the greatest appeals of NitsLoch is the simple level editor we created. The decisions in the editor are based on years of work with the Marathon level editor (Forge) and our own work on the JUICE program. We wanted to make editing as easy as possible, and we've tried to keep things intuitive and fast. The new level file format is relatively compact, easy to understand, and totally open and free. We hope to build some kind of fan base so that many scenarios will be available. The GPL NitsLoch project is on sourceforge. Currently, you can download version 1 or 2 from sourceforge. The download for version 1 is here. Along with NitsLoch itself, you'll need some images and maps. The images and map that came with the original GangWars can be downloaded here. Thanks to the NitsLoch editor, it is possible to create custom levels. Check our scenario database regularly for new levels, and submit your own if you think you've made something special! To submit a map, send it to ddwatts -at- lochnits -dot- com and I'll add it to the database. Please include a readme that at least says how strong the player should be when starting your scenario (a new character, a level 3 character, etc). If you want to, you can even include an exported character that will fit in perfectly with your scenario. Chris Doerr was nice enough to provide the source code for the original GangWars. It is written in QuickBASIC and can be found here.